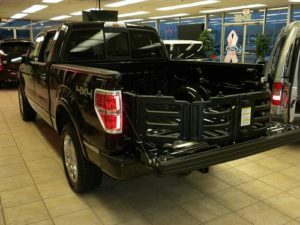 Ford has come out with the specifications for the 2015 Ford F-150 that is expected to be out in Detroit by January, 2014. Ford believes that this brand new truck model will be very profitable according to their studies. It’s anticipated that the 2015 model could be similar to the Ford concept truck, the Atlas Concept that came out last year in some fashion. 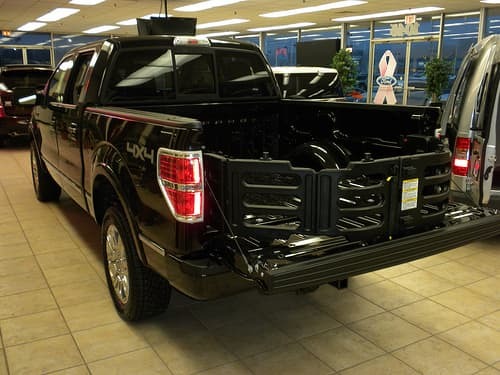 The production model of the 2015 Ford F-150 had similar bulging out fenders as the Atlas, as well as more aluminum in its frame and bed, in order to make the truck lighter and thus make the fuel economy better. The rumors say that the new truck could be between seven hundred and seven hundred fifty pounds lighter than the 2014 model of the F-150. Other Atlas features the 2015 Ford F-150 could have implemented into it are better aerodynamics, targeting guides on the rear-view camera, and a trailer hitch assist, but no one is one hundred percent certain as yet. The 2015 Ford F-150 is expected to maintain this year’s F-150’s five liter V8 engine, and its twin turbocharge three and a half liter V6. If so, it would also have the Ford F-150 2014’s 365 horsepower and its 420 pound feet of torque. It’s expected to have the same type of EcoBoost engine as previous Ford truck models as well. Tests also showed that if so, the Ford F-150 2015 model would have at least 18 miles to the gallon fuel economy; though some rumors say it should have a bit better gas mileage, of as much as 21 miles to the gallon. It’s also said to either have the same 2014 3.7 liter V6 or perhaps a smaller one that may only reach 300 instead of 365 horsepower. Another possible type of engine is Ford’s premiere Duratorq 3.2 liter inline 5 cylinder model, which was said to possibly be tested in a F-150 model. The 2015 Ford F-150 is also expected to have the My Ford Touch infotainment system; however, it is expected to have had its operating system improved. Some say it is possible the new 2015 model will also have a diesel version, but nothing has been confirmed as of press time. Whatever the new 2015 Ford F-150 comes out with, in the past these versions of Ford trucks have been quite popular and Ford is hoping for the same results again next year.